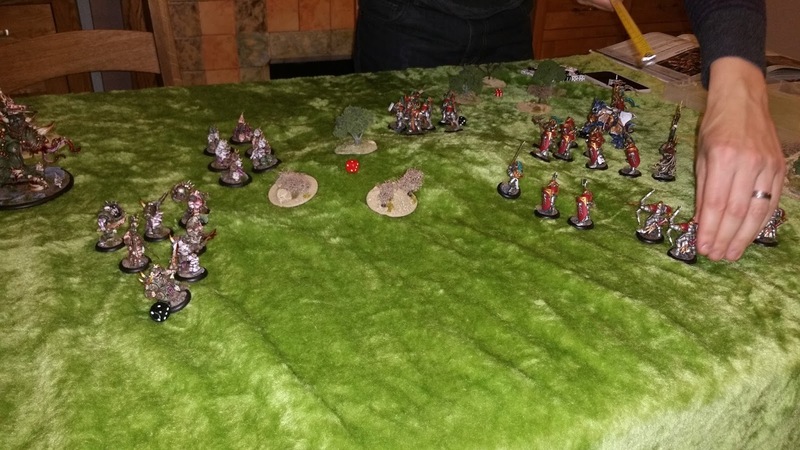 With a weekend down at my brothers I thought I'd introduce him to Age of Sigmar, we played a lot of Warhammer when we were kids and over time both wandered away from it mainly to play historicals and other fantasy and scifi games. With 3 options of forces Phil opted for Stormcast eternals. The Rotbringer host of Morbidex Twiceborn has discovered an ancient circle of power within an open glade in Ghyran, the realm of life. The skies darken as his Brayshaman, Morak begins a ritual to summon forth daemonic forces to aid their conquest. Clouds boils and thunder strikes, trees at the edge of the glade burst into flames, the smoke clears a little and from the destruction stride giant silver armoured warriors. 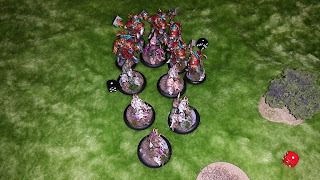 Morbidex readies the small force he has andd moves to intercept, trying to grant Morak as much time as is needed to complete the ritual. 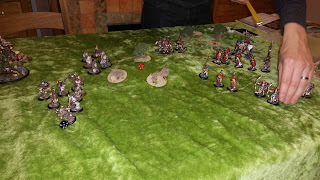 Our game was to be played with the Rotwater blight Time of War rules and the Battleplan was of course The Ritual. 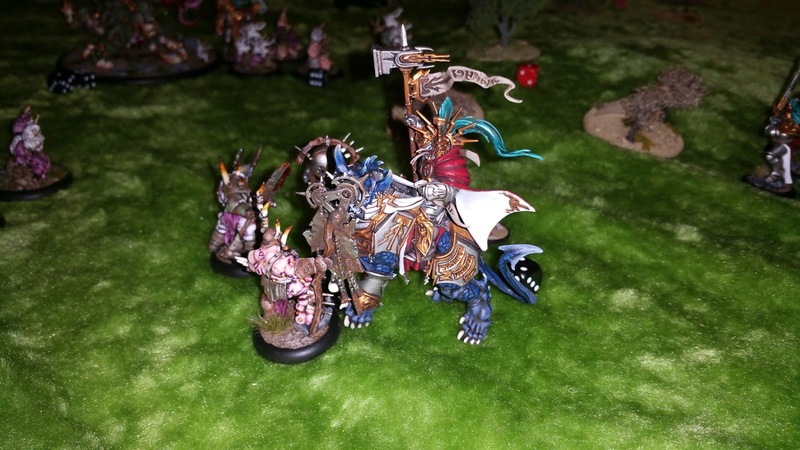 Under the command of Lord Celestant Jargus Thunderborn, the Stormcast forces surge forwards, with most of their abilities and weapons out of range there is little else they can do just yet. The forces of chaos hold back awaiting the Stormcast warriors. Out of the guts of Morbidex three additional swarms of Nurglings are spawned, t hey gibber and yell heading off to meet their kin and moving up the battlefield, keen to cause mischief. The Stormcast force once again moves up, with the Judicators in range a hail of arrows shoot forth and wounds a Putrid Blightking. The Retributors gain pace and slam into the gibbering Nurglings their mighty hammers crashing down to little effect, the mischievous imps darting left and right out of their way. With a mighty belch Morbidex's maggoth vomits up more swarms of nuglings who scurry off to bolster the center of the force. Heaving forwards the mighty maggoth crashes into the Stormcast Retributors, it's monstrous claws and Morbidex's Fleshreaper Scythe cleaving through 2 of their armoured foe. The main stormcast line continues it's march towards the Blightkings, lightning flashes from the Lord-Celestants Dracoth scorching down Morbidex's side and blasting several Nurglings apart just as a hail of arrows flies overhead burying themselves deep into the Maggoth Lord. The Lord Celestant Jargus urges his Cracoth forward, it's clawed feet pound across the field of battle and they crash into the Putrid Blightkings, between them several of the plague-ridden warriors are cut down. The Blightkings continue to hammer at the the Lord Celestant, wounding him in return his great hammer dispatches another one. Seizing the opportunity Morak redoubles his efforts, calling forth a mighty daemon from the other realm, the clouds roll and groan with power, but clearly the time is not right and the summoning fails. Across the rest of the field of battle little ground is gained by either side, a couple of Retributors fall to the might of the Maggoth Lord and tiny clawed hands of the Nurglings. Drawing their mighty skybolt bows back the Judicators launch a devastating hail of arrows across the battlefield, the mighty Maggoth topples over, it's rotten flesh pierced by arrows and scorched by chained lightning. With the armoured support of the Liberators joining the fight, they and the Lord Celestant slays the last remaining Blightkings. This set of events does not bode well for the forces of Chaos. Morak the mighty Bray shaman calls upon the power of chaos and summons a Deamon Prince to aid them. The greyskinned daemon roared and charged into Lord-Celestant Jargus, with a mighty swing of his Hellforged Blade he slew the celestial warrior. 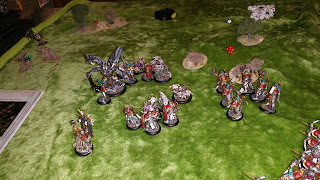 The Liberators continue their struggle with the hoard of Nurglings, the impish creatures proving difficult to slay as flesh knitted itself back together and their numbers seem to ever grow. 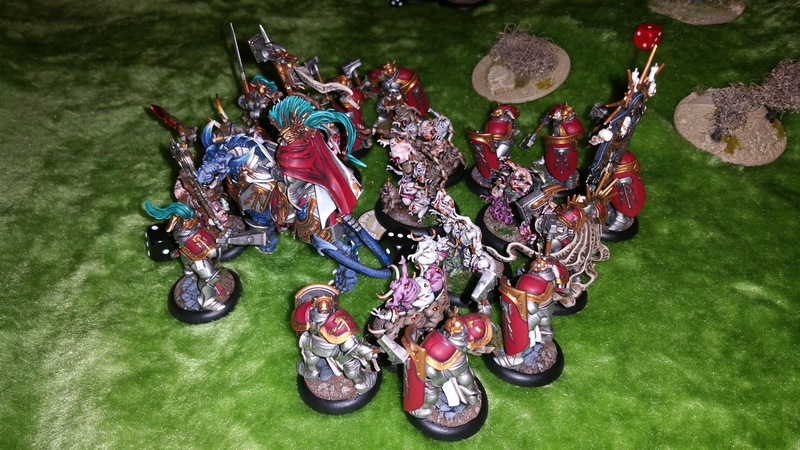 Taking command Lord Relictor Kuldor calls upon Sigmar to aid them against the monstrosity that appeared before them, in a blinding flash of light a unit of Retributors appears, armour crackling with with Sigmar's Wrath. Once again the Judicators take aim and rain arrows down upon the Daemon Prince, arrows tearing at his flesh it appears to be seriously wounded. Hefting up their mighty hammers the Retributors charge in, with a deafening crash their hammers hit home and finish the daemon prince off, it's physical form exploding outwards in a shower of filth as it is dragged back to the Warp. 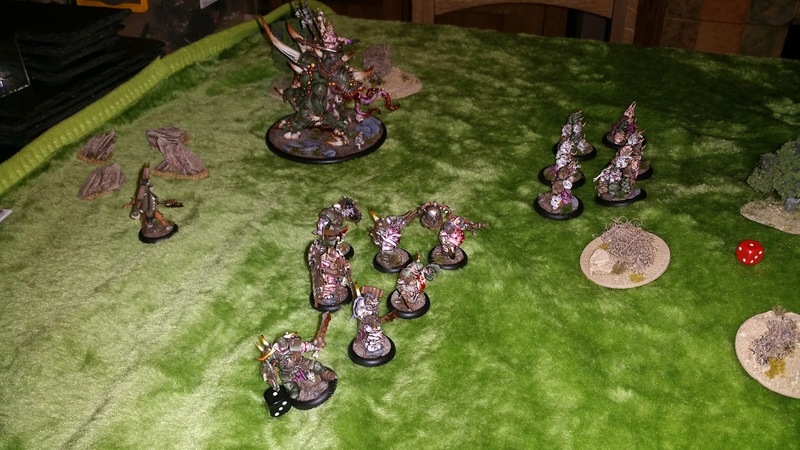 Their hammers lashing out once again the Retributors mop up one of the swarms of Nurglings. Having broken free of combat, Lord Relictor Kuldor surveys the battlefield with only a handful of Nurglings and a Bray shaman left it appear to be all over for the forces of chaos. 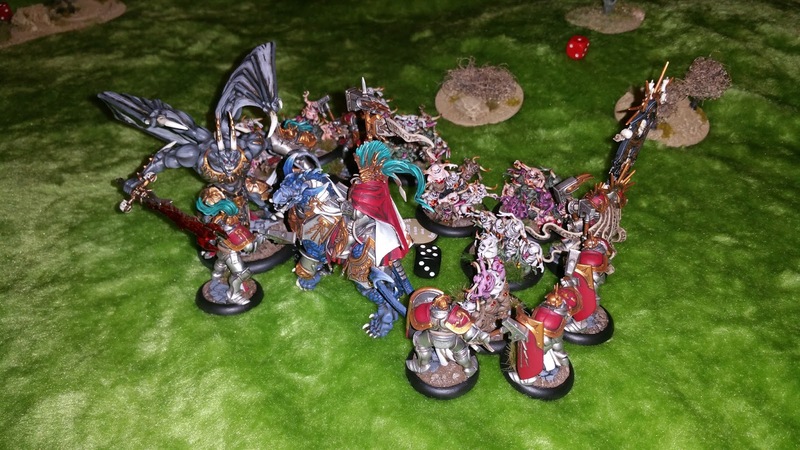 The ritual had failed and the Stormcast were victorious. I really enjoyed this game, the forces seemed dwell balanced (I sense checked the points on both Clash Comp and SDK but without balancing 100%) I'd added the Brayshaman in to help with the ritual knowing he could summon but resisted it until quite late in the day when the tide seemed to be turning against me. 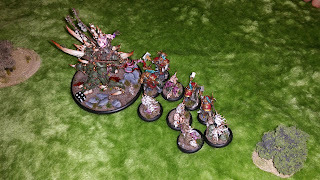 We forgot a whole host of rules, several of the Time of War ones, especially Help me Grandfather Nurgle, which may have saved Morbidex from death. Rules upon Rules - Each Warscroll, Time of War and Scenario has a host of additional rules which have to be applied on top of the 4 pages of core rules, this makes it difficult to remember everything that needs to happen. Lack of Standardisation - A lot of effort could have been saved by standardising certain rules such as unit leaders, banners and musicians to have the same effect no matter the unit. This would simplify the rules further and remove the need to check warscrolls each time. Randomness - At times the game is just too random, effects such as the retributors hammer ability should be something you can rely on, this would make clear tactical decisions to be taken about how and when to commit rather than chucking them in and hoping for the best. 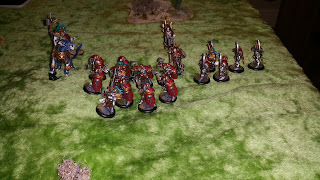 The difference in capability from the first and second unit of Retributors was really visible here, one unit got bogged down and eventually killed by a unit of nurglings, the other unit jumped in killed a Daemon Prince and several bases of Nurglings in a single turn. Dice, so many Dice - It is possible to have to roll upto 6 sets of dice for a single combat resolution, Random Attacks, To Hit, To Wound, Save, Damage Roll, Wound/Mortal Wound Save. This really adds to the randomness mentioned above. One of the worst offenders in the game is a Bloodthirster, with 4 attacks and D6 damage it's really unreliable, even if all 4 attacks hit, wound and saves are failed you can do between 4 and 24 wounds in a turn, that's a pretty wide range. 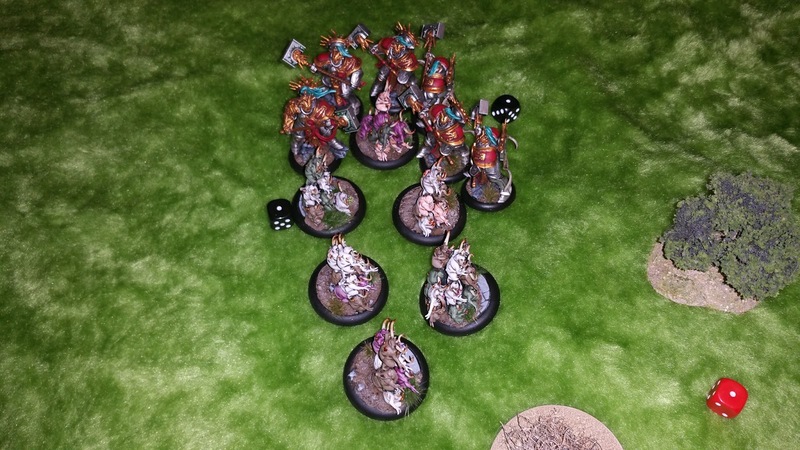 On the flip side, whilst we were discussing the rules and playing other games on Sunday I realised I was tackling the game a little wrongly, it's a framework of rules with additional modules that can be used, rather than a complete set of rules with addons. A subtle difference but it gave me an idea on how to tackle it; Some kind of battleboard for each player, with reminders for the additional abilities you gain at various phases dependent on Scenario, Time of War rules etc. I also need to make a set of tokens for the game fairly urgently also to act as reminders for effects. Anyhow, I'm sure you'll see something from my Brother on this, either on his blog (http://infrequentwargamer.blogspot.co.uk/) or in the comments below. Anything I get for Christmas. Cheers for the game bro. Very nice collection to bring to the table, and assembled in impressive time. I'll just say I think AoS had good potential but was poorly and lazily implemented by GW. 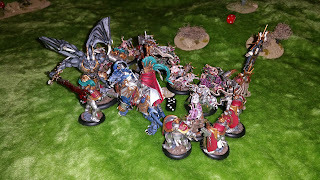 I can see what you like about it, but my impression from that game was that ease and fun of play of the core rules is weakened by the bazillion special rules and randomness, like the 'buckets-o-dice to roll sixes' special rules. Figures are mighty impressive though.